A few weeks ago, on August 20, 2011, I joined a group of birdwatchers at Mann Lake in Lewiston, Idaho. We were there to see any birds we could, but in particular we were looking for shorebirds that might be migrating through the area. We had had an unusually wet spring and the reservoir was still fairly full so not much shoreline was exposed. On the little mudflat that was there we found killdeer, lesser yellowlegs, a California gull and a variety of waterfowl. We had decided to move to another location when our guide for the day spotted an unusual looking bird landing on the beach below us. It was an impressive looking bird sporting striking black, white and gold plumage. I was curious as to what our new arrival might be and joined with the others cautiously making our way down for a closer look. The bird patiently waited for us all to assemble with spotting scopes, cameras and binoculars and posed for a few photographs before flying off. Our guide said it was a Golden-Plover though wasn't sure if it was of the Pacific or American species. We would have to consult our photos and field guides to determine that. At home later that day I sat down with my photos and field guides and determined (to my mind) that this was a male Pacific Golden-Plover. I then decided to report my sighting on eBird an online global birdwatchers database sponsored by the National Audubon Society and the Cornell Lab of Ornithology. The website said that this was a rare bird for our area, which was exciting, but I didn't give it much more thought. Little did I know that somewhere in birdwatcher cyberspace I had set off alarms, bells and whistles because the next thing I know I'm receiving excited emails from folks who monitor this sort of thing. Did I get photos? Can I give a detailed description? Can I verify my sighting some way? Was I sure I saw what I think I saw? Suddenly, I was feeling very exposed and not so sure that reporting my sighting had been such a good idea. Apparently, Pacific Golden-Plovers are a rare visitor to our area. There has been only one other reported sighting and that quite some time ago. To confuse matters more Pacific and American golden-plovers have very similar plumage making identification difficult. Emails and photos were sent, experts were consulted. Then another bird was sighted. Was this the same bird or a different one? Male or female? And really, neither golden-plover species was very common here. What had appeared to be a straightforward i.d. suddenly had become a great mystery and puzzle to be solved. It has been almost a month now since I reported that crazy bird. The debate is still going on. Last I heard the consensus was it's a female American golden-plover, but I think we will never know for sure. While high powered spotting scopes, expensive cameras and binoculars are wonderful aides in helping us identify illusive birds they are no substitute for a bird in hand, but that is no longer legal like it was in Audubon's day. The best we can rely on is still not good enough so we are left wondering. In my mind the mystery is solved. 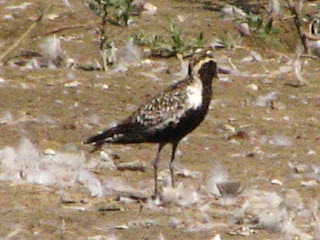 I tend to go with first impressions and my impression was that I saw a male, Pacific golden-plover. Do I wish it were that because then I could say I've seen a rare bird? No, I don't think so because the American golden-plover is also uncommon here. I just believe what I believe.